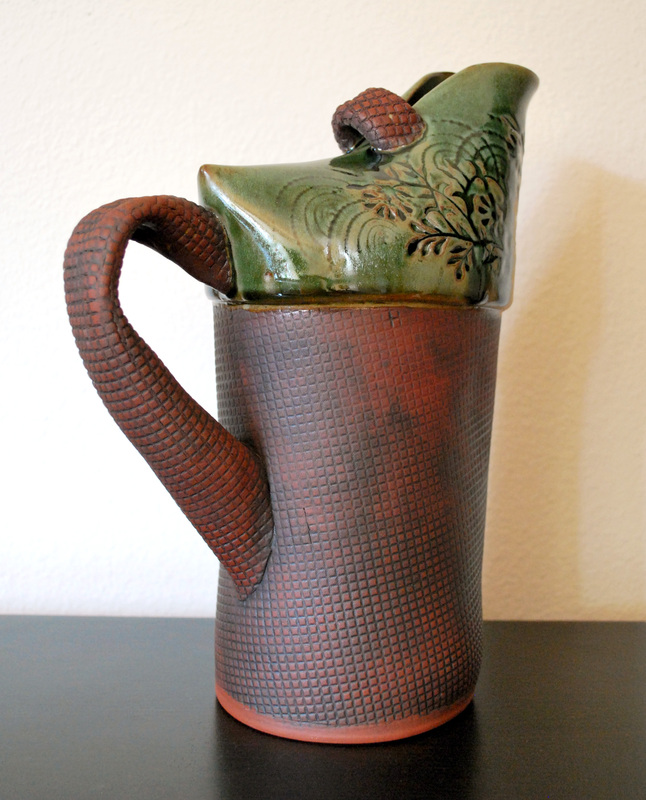 This was the last teapot completed successfully in my studio. Sadly, I’ve made at least 8 while in SF, and this is the only one that survived—thanks to a pre-mixed Cone 6 glaze from a bottle, brushed on. 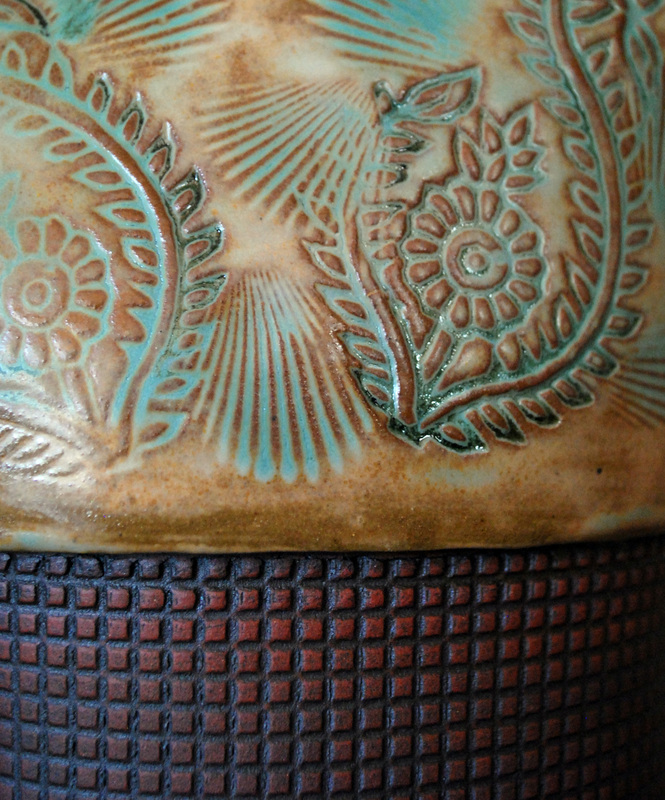 Inner liner glaze is my own. Let’s rewind the clock to Fall of 2012. September. I finally set up my little studio in the garage of our Redwood Shores townhouse rental, I was excited to continue my teapot making…I was starting to really enjoy the process. Got my little Skutt kiln hooked up after paying the electrician $300 for a special outlet—this we negotiated down from $500! Bought the necessary glazing materials and equipment…this was not cheap either since I couldn’t bring all of my wet glaze materials. So, fast forward a few weeks… many bisqued teapots, cups and bird houses and other little experiments I was ready to glaze. Mixed up my usual batches of tried and true glazes in test quantities and fired up my kiln to cone 6. They seems to look fine… but it wasn’t. 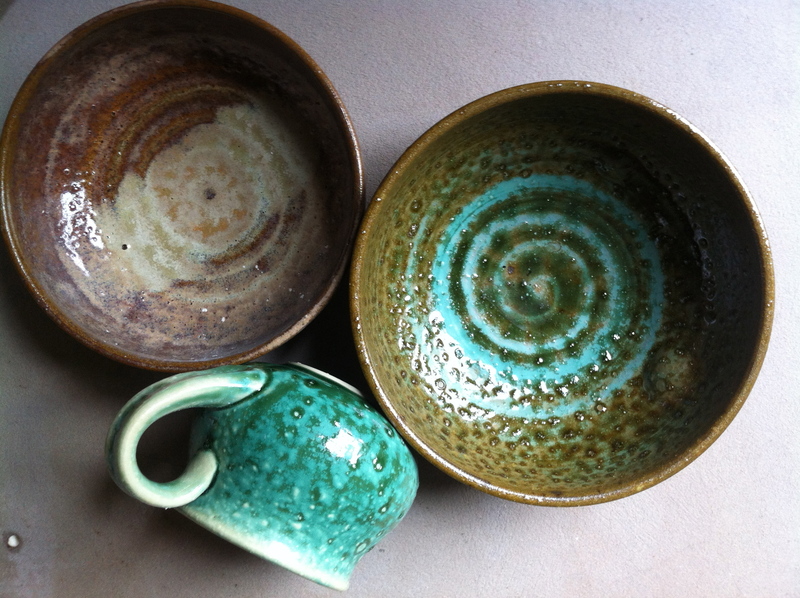 My second glaze firings included those new teapots and every pot came out with blisters! I mentioned this in my previous post, but didn’t get into what happened to my teapot making. 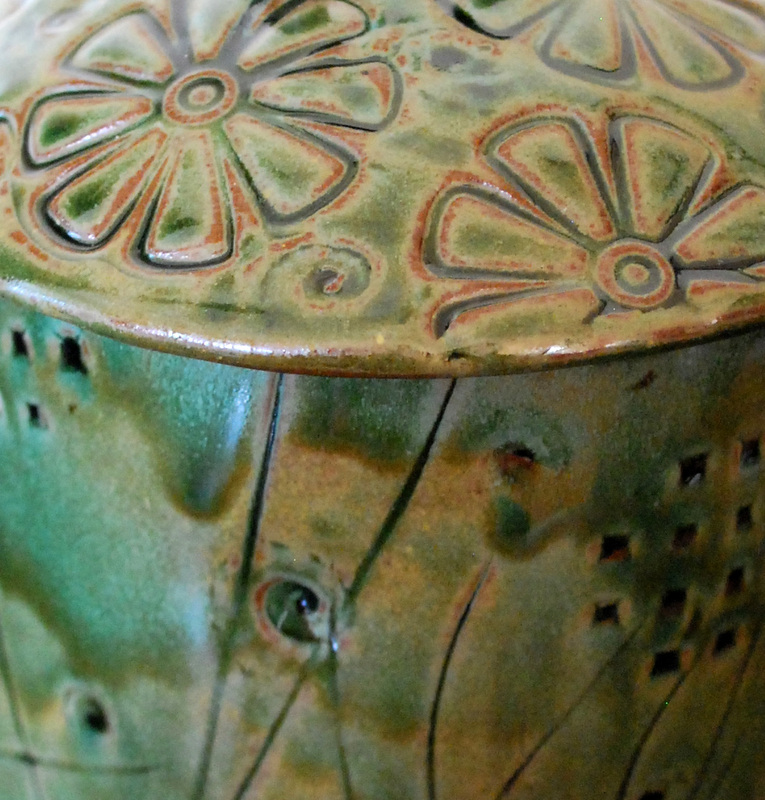 Well, I was distraught, so I stopped making teapots…it was too heart breaking. I started hand-building and reformulating glazes and testing, testing, testing—glaze mixtures, clay bodies, temperatures, ramp/hold/cooling schedules. 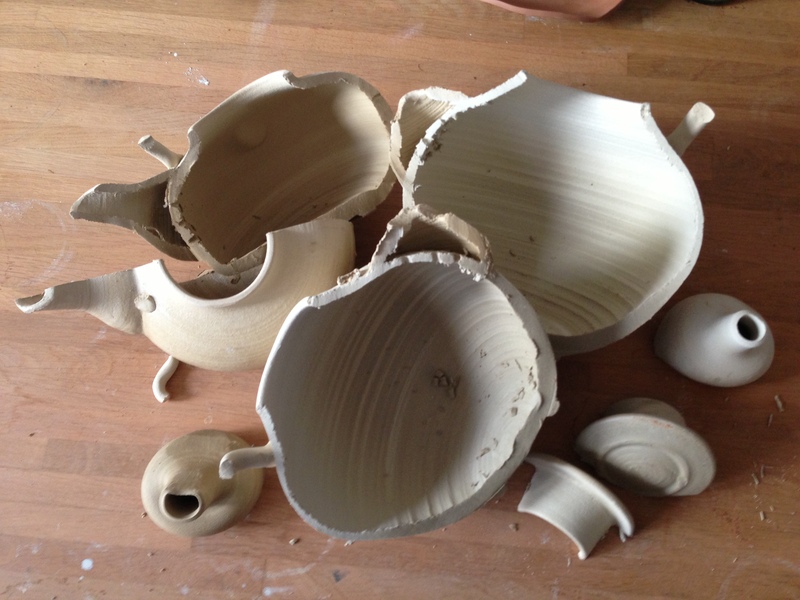 Turns out it was a bisque temperature and kiln load density issue…yes 5 months of testing! 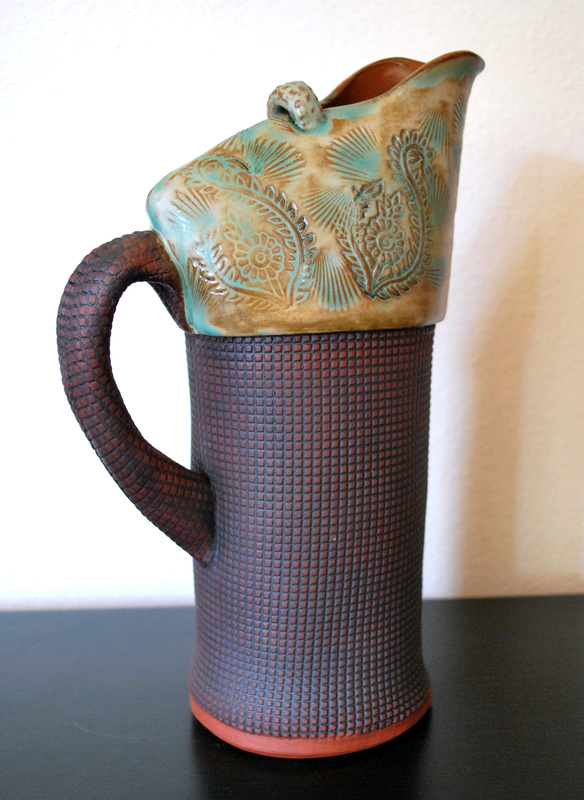 At least now, I have several new glazes that work beautifully (also found in previous post). Fast forward again to this weekend. 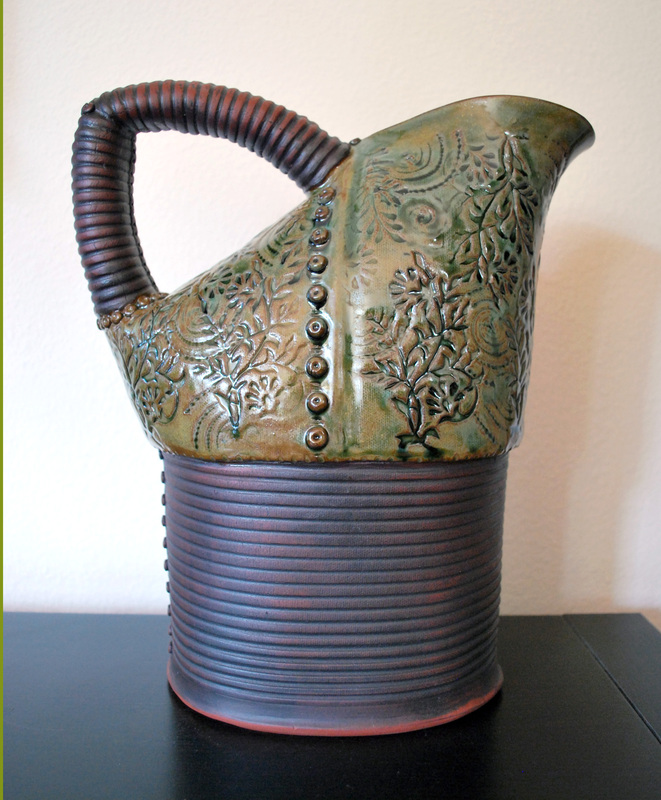 I took a hands-on Ultimate Teapot Workshop with George Dymesich offered by OVCAG at Higher Fire in San Jose. Well, I think my groove is coming back. George was a very patient and thorough teacher, showing each step with explanation of why certain techniques are used, both functional and aesthetic concepts. All this time, I didn’t understand why there is a hole in the lid! It’s to allow liquid to flow without gurgling. AHA! There were many other Aha! moments throughout the day. Not only from George’s instructions, but from working with 10 other fellow potters learning, encouraging and inspiring from each other. Seeing little home made tools and shortcuts like: a little painter’s sponge bought at HomeDepot stuck at the end of a stick works so much better than ones you buy from the clay store! And I learned how to use a throwing stick on the inside of a pot to give volume…and I successfully threw a 5 pound clay pot! Now I should have some photos of my hard work…nope. Packed it up in the trunk at the end of the day, got home and while unloading my pieces, dropped it on my garage floor. FLOP! 1. Got over my “precious pot” syndrome. It’s the “don’t cry over spilled milk” for potters. Kind of. 2. My throwing is getting better, even walls, mostly. Still need to work on not thinning out at the rim. Wow, my last post was a long time ago. 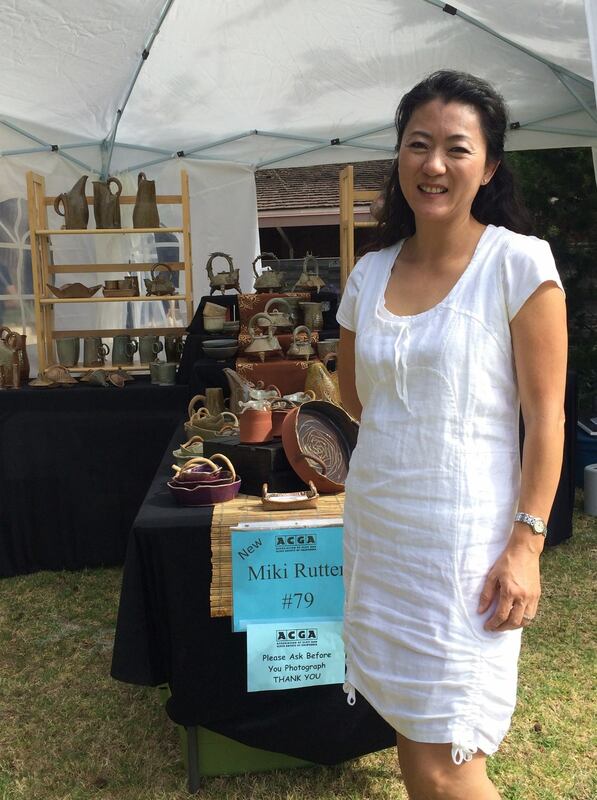 I did take a break after the Art In Clay Sale in Palo Alto with the Orchard Valley Ceramic Arts Guild. It was a great experience, 72 clay artist presented their work and every one as unique as they are. Everything from everyday coffee mugs to sculptural figures, mini tea pots to giant outdoor ceramic garden slug that was 10 feet long! I showed my pottery brought over from Chicago as well as my new bird houses thrown on the wheel. And in to celebrate the winter holidays approaching, I also made little ceramic bird ornaments. Those were a HIT! 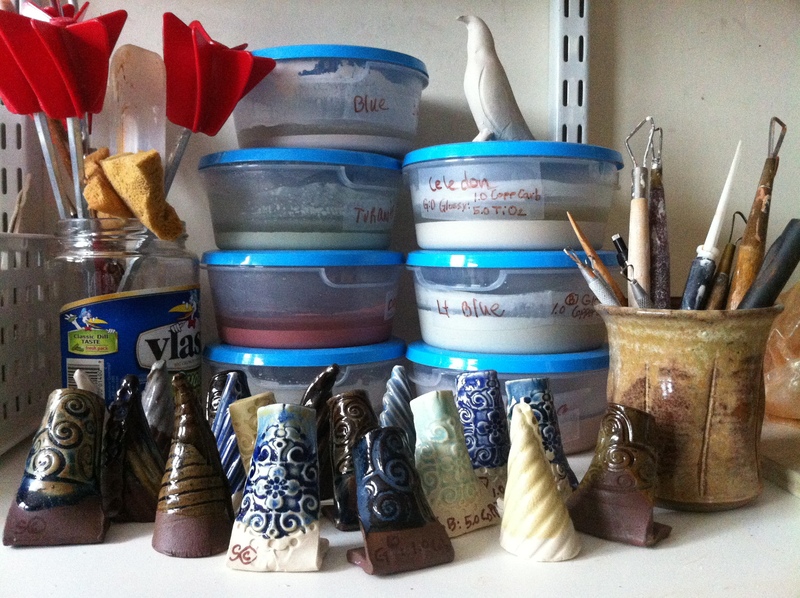 I began mixing my glazes again in my studio and as you see above, it did not work very well. It was awful. Every batch of my trusted glazed were blistering. Same recipe, same clay, same temperature and still no. So I tested a few more glazes, and the test tiles came out fine, but when moved to the big final pieces, still blisters. So, many months of struggling, giving up and trying pre mixed glazes out of a bottle, I finally got the recipe right. Only 5 months of anguish! It wasn’t my glaze recipe. It was the bisque temperature and load density. I played with too many variables…new clay bodies, temperature and time shifts, load variations. But the one I didn’t try was firing my bisque higher for my red clay body. 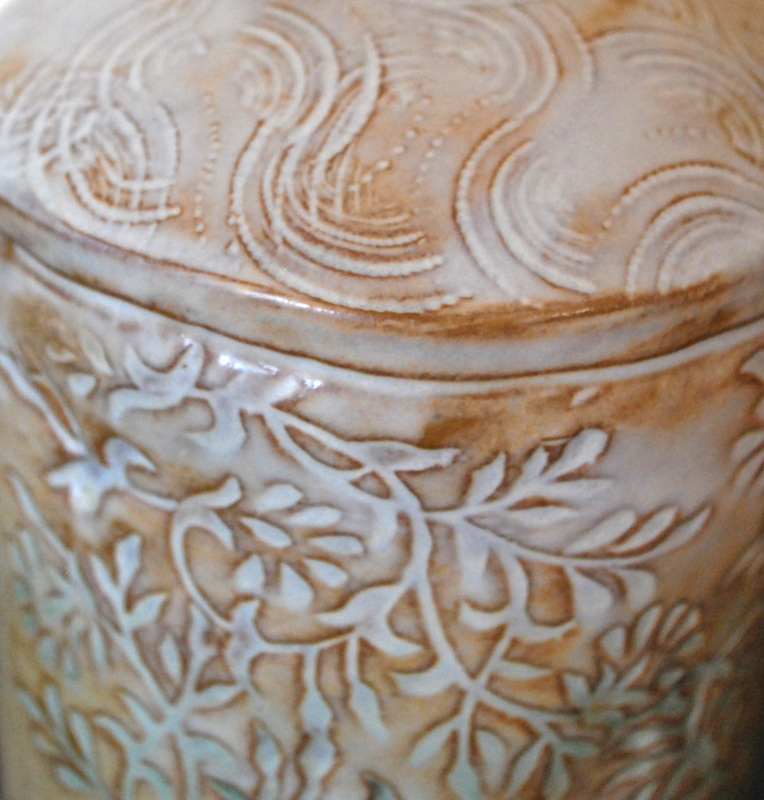 Since it has more impure particles, it needed more heat to burn out so that in the glaze firing , it doesn’t try to escape into my glaze surface. So, solution: Bisque to Cone 02=beautiful glaze finish. I did end up with new glaze formulas in the process. See below. Maybe in following posts, I will share my recipe secrets, but it’s really not that secret, what I’ve modified in these are more the application process and allowing the clay body’s natural color to show through to enhance overall appearance and depth to texture. I always thought that I didn’t have a talent for hand building clay pots. I looked at the slab of clay as a painter may look upon a white stretch of canvas. Some see possibilities and some see white canvas. I saw slab of clay. 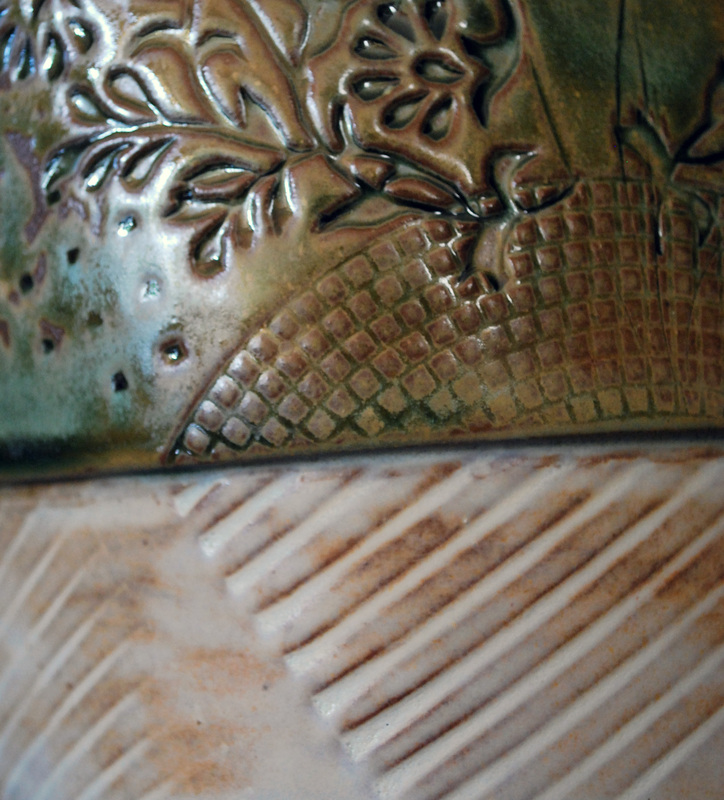 Enter Orchard Valley Ceramic Arts Guild… Mold making workshop with Jamie Meador, Art In Clay Artists, Jill Getzan‘s rain sticks, Lynn Wood‘s Slaberation workshop at Clay Carnival at Clay Planet.What do they all have in common? Texture. Everywhere! Enter my patio garden…We don’t have a back yard yet, still renting in the bay area, so we have a stone slab patio garden with succulents in pots and a few indoor house plants. I needed a watering can and didn’t want to resort to a generic plastic watering can. 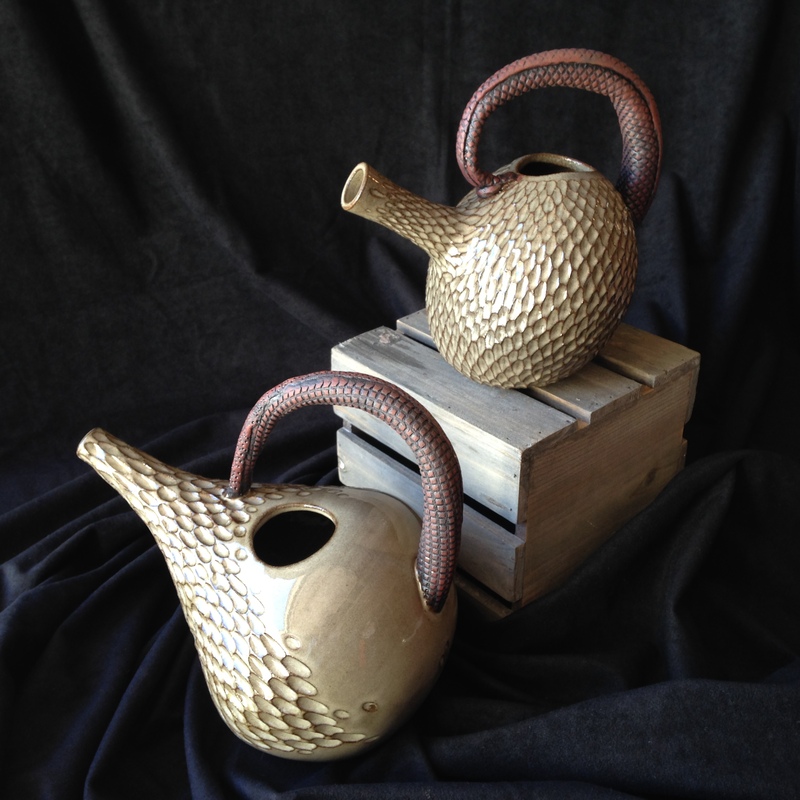 “Well, I can make it myself with clay!” 2 months of experimenting…. Oh, and I forgot to mention the beauty of the oxide wash! These are the results of the Manganese Oxide wash in various solution ratio and wiping power. These photos aren’t very good, I need to find my sweep again but I am quite happy with how they turned out. These can be found on my etsy store. Would love to hear your thoughts and encouragement.